So since Roman times at least, they've hung out in tents when on campaign. But since war doesn't usually come to them, soldiers usually end up going to where the war is, often in inclement weather. That's where the tents come into play. Tents, though, can be heavy to lug around. Starting mid-way through the American Civil War in Summer 1862, Union soldiers were issued "dog tents" (the technical name was "shelter half" because two of them buttoned together made a small "pup" tent). Groups of them could be put together to make "shebangs" (hence the term "the whole shebang" meaning "everything together"), and each half was light enough to be carried easily rolled up inside or on top of the soldier's knapsack. Individual shelter tents in one form or another have been issued to soldiers of many armies (though not all, depending on the country's treasury), but at the same time, officers, cooks, engineers and others needed bigger tents. And when time came to move where the war was happening, the tents got folded up and put onto the backs of wagons/trucks/tanks. Numerous AM resin companies like Legend and Black Dog have been releasing stowage sets tailored to individual kits, but what about those kits that don't have their own stowage? Inside a Ziploc baggie with a hang card stapled to the top are 16 pieces of gray resin stowage. As the name says, this is (stowed) gear at a value price. For €9, you get enough folded tents (some with poles inside), packs and other assorted stowage for one good piled-up AFV, or some added realism on several. At these prices, get a selection of items (set #1 is reviewed here, and set #2 here. Steve Munsell, the American-born owner of Ireland's Value Gear, is quite frank about how VG's offerings are evolving as he looks for ways to give modelers what they want. 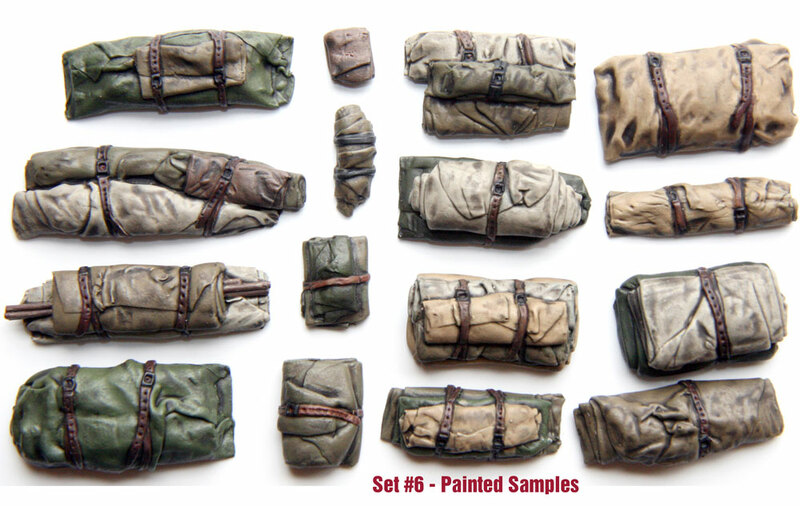 He has recently released a set of generic crates, and the stowage sets have all kinds of items, large and small. The details are generally very good, though some of the tie-down straps look thick to me. Where they span a depression or other opening I'd suggest a little work with a hobby knife thinning the resin. The detail on the straps, including buckle and eyelets are sharp and crisp. As usual, the casting is excellent with little or no flash or "hair," and small pore plugs. You will need a razor saw to separate the stowage from its plug, so be careful both about the resin dust and the risk of cutting into the good part if you're not careful. There is no painting guide, since you can pretty much adorn these as you see fit. Just be sure to soak them in Blech Wite or some other solution to remove the mold release chemicals. For those who are reluctant to spend $35-$50 for a dedicated resin stowage set, these from Value Gear are just the answer. While it might be easier in some cases to purchase a stowage set for your particular vehicle, most kits don't have a dedicated stowage set. Yet soldiers & tankers like to take their shelter with them, so stowage will go a long way towards making your build look more realistic. Value Gear is just that: a good value for adding gear to your build. Thanks to Value Gear for providing this review sample. Be sure to mention you saw it reviewed here on Armorama when ordering from these nice people. Highs: Reasonable in price, generic for almost any army after the Renaissance where soldiers are using canvas. Lows: The tie-down straps are a little thick to scale. Verdict: Highly recommended. Instead of the expensive stowage sets you're used to, here is a reasonable solution that works for almost any situation. You're welcome, Sean! And you're right, they're good value for money.